It is Easter again and for most kids, this means HOLIDAY!!! 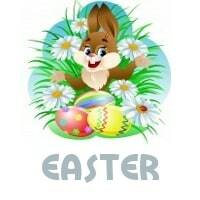 Many people – both religious and non-religious – celebrate Easter every year … a time of new life. It’s a nice time to hang out with family and to eat some rabbit shaped chocolate. But, there’s more to this well-liked holiday than meets the eye! In many circles, it’s traditional for there to be a yearly Easter egg scavenger hunt, or similar variations. This is where our Easter scavenger hunt clues add some new twists to traditional fun. These fit well with the story behind Easter too! The idea of an Easter Bunny coming into your home and hiding chocolate is ingrained into mythology, much like Santa Claus leaving presents for children at Christmas. And – just as many adults still write “from Santa” on gifts they give to one another – many people still like to hide things at Easter, claiming that a giant rabbit did it, and host an Easter egg scavenger hunt for ‘old times’ sake’. Now you can choose how much you pay, from $2.99-$6.99, it’s your choice. Every bit helps to keep this site going and expanding. For Easter hunt ideas, check out our scavenger hunt ideas page. Eggs, Nests, Basket, Easter Dresses, Peeps, Grass, Flowers, Chocolate, Shell, Dye, Duck, Sunday, Pot, Chicken, Candy, Cross. In the traditional stories of the Easter Bunny, the things that are usually said to be hidden are eggs. This might lead you to think that you should hide eggs on Easter so that you can mirror the plot of the holiday, but you don’t always need to use eggs and certainly not real eggs. However, whatever you hide, it is wise to make sure you keep careful list of where you leave eggs/prizes, as they’ll need collecting at the end of the Easter hunt. Should you insist upon hiding real eggs, then consider draining and dying them festive colors beforehand. It’s an Easter tradition and it will make any children involved more interested in hunting them down. In fact, it makes them easier to see as well, so it might just save you from having to hunt down any leftover prizes. Using our Easter clues means that you can retrace where the eggs were hidden, as you can reference the clue answers for the locations. For a fun twist, and to make the photos cute, you can get the kids to put the eggs into Easter baskets and even dress up for the occasion. Alternatives to real eggs include egg shaped chocolates and plastic eggs with money or candy placed inside of them. These are great options and far more popular with the kids (there’s a surprise!). However, almost anything can be hidden, including a ‘grand prize’. If you use our riddle clues to lead to all these hidden eggs and prizes, try only providing new clues upon completion of each, or hiding the clues with the prizes … so they have to find it in order to continue. If you want to organize more hunts, use these photo scavenger hunt clues. Click the link.